A team of researchers at the University of São Paulo in Brazil has developed a new levitation device that can hover a tiny object with more control than any instrument that has come before. 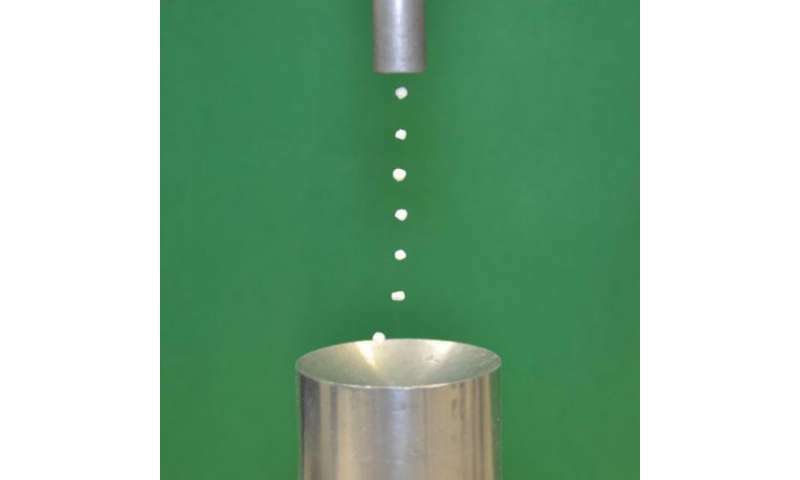 Featured on this week's cover of the journal Applied Physics Letters, from AIP Publishing, the device can levitate polystyrene particles by reflecting sound waves from a source above off a concave reflector below. Changing the orientation of the reflector allow the hovering particle to be moved around. Other researchers have built similar devices in the past, but they always required a precise setup where the sound source and reflector were at fixed "resonant" distances. This made controlling the levitating objects difficult. 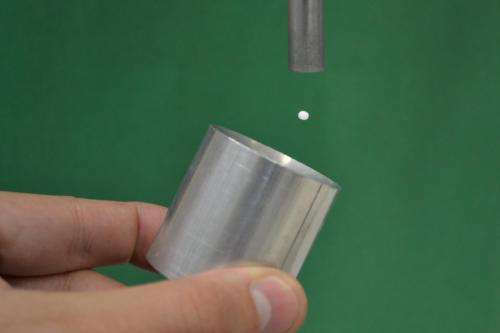 The new device shows that it is possible to build a "non-resonant" levitation device—one that does not require a fixed separation distance between the source and the reflector. This breakthrough may be an important step toward building larger devices that could be used to handle hazardous materials, chemically-sensitive materials like pharmaceuticals—or to provide technology for a new generation of high-tech, gee-whiz children's toys. "Modern factories have hundreds of robots to move parts from one place to another," said Marco Aurélio Brizzotti Andrade, who led the research. "Why not try to do the same without touching the parts to be transported?" The device Andrade and his colleagues devised was only able to levitate light particles (they tested it polystyrene blobs about 3 mm across). "The next step is to improve the device to levitate heavier materials," he said. In recent years, there has been significant progress in the manipulation of small particles by acoustic levitation methods, Andrade said. In a typical setup, an upper cylinder will emit high-frequency sound waves that, when they hit the bottom, concave part of the device, are reflected back. The reflected waves interact with newly emitted waves, producing what are known as standing waves, which have minimum acoustic pressure points (or nodes), and if the acoustical pressure at these nodes is strong enough, it can counteract the force of gravity and allow an object to float. The first successful acoustical levitators could successfully trap small particles in a fixed position, but new advances in the past year or so have allowed researchers not only to trap but also to transport particles through short distances in space. These were sorely won victories, however. In every levitation device made to date, the distance between the sound emitter and the reflector had to be carefully calibrated to achieve resonance before any levitation could occur. This meant that the separation distance had to be equal to a multiple of the half-wavelength of the sound waves. If this separation distance were changed even slightly, the standing wave pattern would be destroyed and the levitation would be lost. The new levitation device does not require such a precise separation before operation. In fact, the distance between the sound emitter and the reflector can be continually changed in mid-flight without affecting the levitation performance at all, Andrade said. "Just turn the levitator on and it is ready," Andrade said. When can we have the levitating skateboards of Back to the Future movie?